If you are looking for service technicians that are prompt, friendly, courteous, and certified then you need to look no further than AZ Garage Pros for garage door repair. 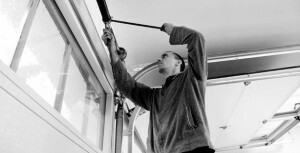 Our technicians will treat your business or home with respect while also providing you with work of high quality. We are devoted to providing service, installation, and repair that is courteous, honest, and prompt. We are also dedicated to providing you with competitive prices, which means if you choose us for your first service you will continue to come back for future needs. 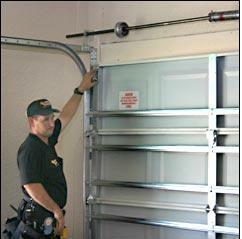 We offer a number of services for your garage door from maintenance checks to replacements to troubleshooting repairs. The technicians we have are certified, trained, local, and uniformed and they arrive on time and quickly with trucks that fully stocked for service that is quick and 24/7. 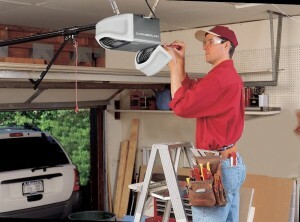 The mechanical unit located most often on the ceiling is the garage door opener. This opener allows you to operate your garage door automatically. Sometimes with human misuse or age, these units will break down. We are able to replace the unit or repair the unit using solutions that are cost-effective. Springs are very important when it comes to lifting your door. This means that these are subject to a great deal of pressure and weight. This can cause the springs to break or lose force over time. We are able to fix this by adjusting the spring’s tension or even replacing springs that have been broken with Oil-Dipped Springs that are state-of-the art. Sometimes the garage door will come off the tracks if they get hit by objects. Other reasons this can happen is wear-and-tear that is natural and earthquakes. We are able to fix the tracks that are damaged and also able to provide alignment service so that your door will be returned to the original place. Cables are susceptible to breaking and coming loose because of the constant movement with garage doors. We are able to provide you with a number of solutions for fixing problems like these. We can adjust the drums or tighten them. We also have aircraft cables that are heavy-duty that can be used if necessary. Climate and accidents can also cause damage to the panels of your garage door. We are able to fix this for you by changing out the panel without having to replace the whole garage door. We also carry a number of styles so that we will be able to match the current look of the garage door that you have already. Our garage door technicians in the Phoenix, AZ area are not only certified but they are also fast. They are experts when it comes to repairing all types of garage doors and have almost no limitation. If you have a situation that is an emergency with any other type of door, this can be handled as well. Make sure to give us a call to find out exactly what we can do for you! Love the new garage door opener, and spring. The old one we had was old and getting so noisy it is wonderful having our new opener. It is so quiet! Outstanding job by the guys and they were so kind and courteous, finished in record time. Thank you Phoenix Locksmith Pros! Quick and easy replacement for a broken spring. They did a great job. I won't hesitate to use Phoenix Locksmith Pros again. Thank you. Our garage door came off the tracks and wouldn't close. We gave Phoenix Locksmith pros a call and they had someone come out very quickly who was able to get our garage back on track and functioning again. Highly recommend these guys!! This is my second exceptional interaction with Phoenix Locksmith Pros. They arrived on time, worked diligently and provided outstanding service. He was highly knowledgeable and answered all of my questions about garage doors and openers. We discussed the replacement of my equipment, but he didn't pressure me to do so - in fact, he reminded me that my equipment still worked well and didn't need to be replaced. I'm a fan of Phoenix Locksmith Pros I recommend that others give them a try, too. Our teenage son, who's learning to drive, accidentally bumped the garage door and dented 2 of the panels. We did a google search and came across Phoenix Locksmith pros. Upon calling, they sent someone out to help us right away and replaced both damaged panels the same day. Thank you Phoenix Locksmith Pros! We contacted Phoenix Locksmith Pros around 9:00 am. They were able to install a new opener and fix the tracks on our garage door the same day. We were very impressed with the technician. He was very polite and did a great job. We would definitely recommend this company. Our home warranty company sent a garage door repair company out 4 different times to diagnose a problem. That company replaced the opener and all parts, and still did not resolve the issue. We had used Phoenix Locksmith Pros on our previous home, and were very pleased their service, so we called them to come out to inspect. One of their techs came out and determined the issue was with the tension of the door spring. He adjusted it and fixed the problem in no time. The warranty company never even thought to check this. Thanks Phoenix Locksmith Pros! Such a great experience with Phoenix Locksmith Pros. They came and inspected the door. The tech was very friendly and knew exactly what to do to fix the problem. He even went above and beyond to find out why my door was making so much noise each time it opened and closed. All done efficiently and professionally. Door works great and quietly. Will definitely use them again. From the time I called to make the appointment to the completion of the project, Phoenix Locksmith Pros exceeded my expectations! They were able to come out the same day, my technician, called ahead to let me know he was on the way. He gave us a fair price and performed the work flawlessly. 5 stars to this company for a job well done. I highly recommend you give these guys a call! They did a great job in my home, they worked fast, with a great attitude. They were on time, they are very knowledgeable and gave me great advice for maintenance and best of all my garage looks great! Good job boys!